Kharma International writes: "Every year Kharma’s technology and program evolves and therefore this year, we proudly present the Enigma Veyron EV-4 loudspeaker and a completely new cable program. Kharma will introduce three different cable series, with each their own set of characteristics and details in sound. These three series all have a new look and feel and together will replace the current cable program. 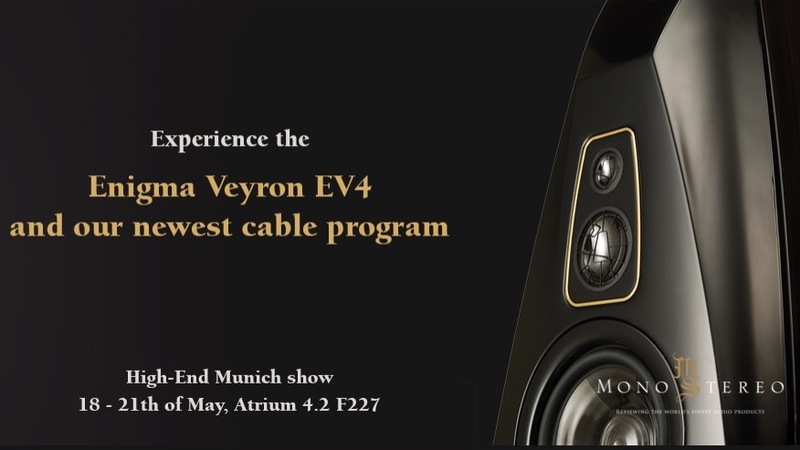 During the Munich High End 2017 all attendees are able to experience the new Enigma Veyron cable series, together with the latest development in speaker technology; the Enigma Veyron EV-4. Which is part of the most extreme and extraordinary line of ultra-performance loudspeakers in the world today. The EV-4 exists of an elegant, ultra stiff and absorbent unique bulletwood cabinet, realizing the most optimal non- vibrant, non-energy releasing storage ever before." These EV-4 cabinets are equipped with the evolution of dynamic driver systems; the Kharma Omega-F drivers. The Omega-F drivers feature a newly developed unique motor system excluding the need of iron as a focusing element, it’s like bringing the engine closer to the wheels, a more effective transmission. This newly developed motor system is located in a carbon chassis, and powers an ultra-stiff and light carbon cone. Because of this technological evolution the driver is able to act faster with less distortion. Vastly increasing resolution across the drivers’ entire bandwidth, allows better transients, less coloration and a more refined complex harmonic structure. Besides the exciting driver technology and non-vibrant cabinet, the stand has another unique feature. The stand has a new spike disc suspension system incorporating Carborundum balls sitting on a diamond surface, which minimalizes the contact area through the use of extreme hard surfaces. This year Kharma International will be launching its newest development of the Cable program. Besides the new look and feel of the cables, there will be three different lines introduced, each with their own set of characteristics. This evolution of products and technology will all be presented to you in a clearly recognizable Kharma environment. Kharma will be present in Atrium 4.2 room F227.